Paro, altitude 2200m, is a town and seat of Paro district in Bhutan. It is also the home to the only international airport in the country. 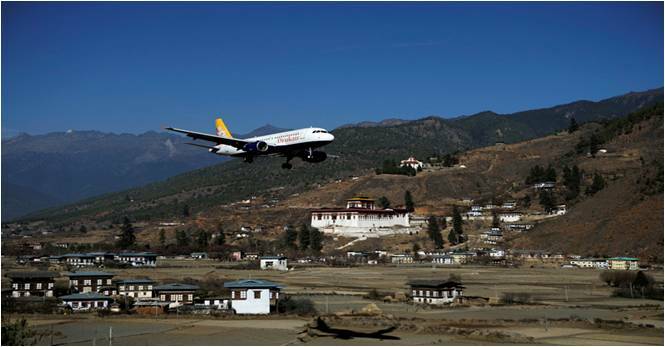 The flight to Paro is considered one of the most spectacular flight experiences in the world. 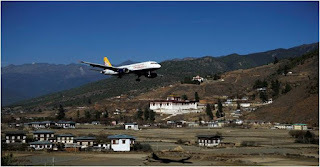 While flying in and out of Bhutan, one can see Mt. Everest, Kanchenjunga, Makula and other high peaks such as Jumolhari, Jichu Drakey and Tsrim Gang. Memorial Chorten: This stupa was built in 1974 to honor the third King of Bhutan, Jigme Dorji Wangchuck. This religious structure is circumambulated only in a clockwise direction (reciting prayers and whirling the large red prayer wheels). 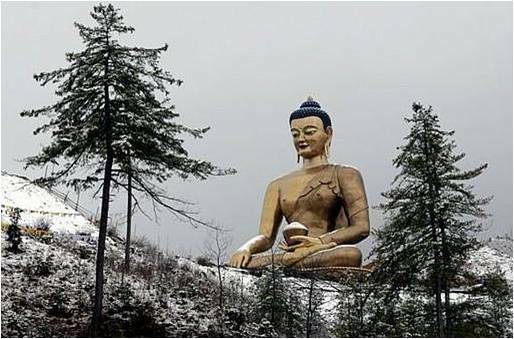 Buddha Point: In the afternoon visit the world’s largest sitting Buddha, an immense statue housing a monastery and visitors center. Enjoy a stunning view of Thimphu city from this point. School of Thirteen Arts & Crafts: It is the primary center of learning for Bhutanese artists. Depending upon the student’s interest, one can specialize in any of the thirteen arts and crafts, including painting, weaving, sculptures, blacksmithing, embroidery, etc. It is the best place for visitors to learn about traditional Bhutanese arts and crafts. Textile Museum: What would be the best dress to attend the festivals in Bhutan? The answer would be “colorful, hand-woven, and made of pure silk.” It takes almost a year to weave one dress, but a textile has become the largest industry in the country. The visit to the textile museum is an introduction to the Bhutanese national attire and the workforce responsible for these items of utility and beauty. Handmade Paper Factory: Although the process of making traditional paper may be simple, a considerable amount of time is required to collect the raw materials, such as the bark of the Daphne plant and certain plant roots for glue. Apart from a small heater to dry the sheets of paper, everything is manually done. Daphne paper is one of the finest papers in the world and is highly recommended for artists. Trashichhodzong Courtyard: This massive building houses government ministries, the Throne Room and the residence of Chief Abbot. Takin Reserve: The National Takin Reserve is where a herd of Bhutan’s national animals reside. Legend has it that the takin is a cross between a goat and a buffalo, but biologists agree that its nearest relative is the arctic musk ox. This bizarre beast looks as if it was assembled from parts of several animals and vaguely resembles an American bison tinged in golden fur. Male takins have been known to hide by lying spread-eagle on the ground. Enjoy another spectacular view of Thimphu from this point. Zhilukha Nunnery: This is the biggest nunnery in Bhutan and is a good place to photograph and interact with the nuns and learn about what it takes and feels like to be a Bhutanese Buddhist Nun. You’ll see many nuns chanting prayers and turning prayer wheels in Zhlukha nunnery. In Bhutan, girls and women are admitted to nunneries for short to long period of time. They are educated in Buddhism here and after their graduation they dedicate their lives in serving the community at large. Spend some time interacting with the nuns and get to know their beliefs and worldview. 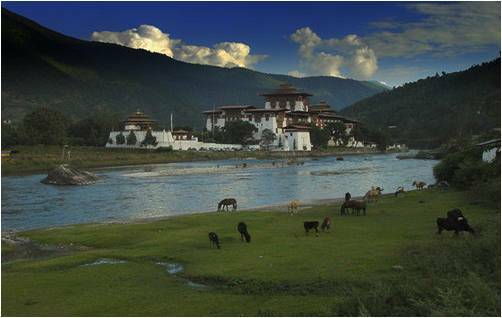 Punakha, altitude 1300m, served as the capital of Bhutan during the time of Zhabdrun Ngawang Namkgyal, the founder of Bhutan. Today it is the administrative and religious center of the district and the winter home of Bhutan’s Central Monk Body. Start your morning by enjoying Dochula Pass, altitude 3150m, with its panoramic views of the Himalayas. The pass is decorated with 108 Druk Wangyel Chorten, which were built to celebrate the stability and progress, brought to Bhutan by His Majesty Jigme Singye Wangchuck, the Fourth King. Chimmi Lhakhang: Take a 45-minute hike round-trip through the rice field to Chimmi Lhakhang, the 15th-century monastery built by Lam Ngawang Chogyal on the spot where his cousin Lam Drukpa Kuenley (popularly known as “the Divine Madman”) subdued a powerful demon. This monastery is also referred to as the “Abode of Fertility” and believed that any couple who gets blessing from this temple is blessed with a child in the next year or so. Punakha’s Dzong: The name means Palace of Great Bliss. This dzong stands magnificently on the spit of land where two rivers (Pho chu and Mo chu) meet. Punakha Dzong has special significance in Bhutanese history as the place where Bhutan's first King, Ugyen Wangchuck, was crowned in 1907. It is also the winter residence for the Je Khenpo (spiritual leader) and the entire central monk body. In the evening visit a traditional farmhouse for an experience of an authentic Bhutanese lifestyle and the local hospitality. Here you will get to see the local Bhutanese way of living up close and personal. They are very friendly, would love to chat, show you around and share a meal with you. Spend the night here with the family. Overnight in Punakha Homestay. Paro Rimpong Dzong: Regal and imposing, dzongs are arguably among the most distinctive and important structures in Bhutan. The original Paro dzong dates back to 17th century and was built by Shabdrung Ngawang Namgyel, the man who unified Bhutan. It burned down in 1907 but was rebuilt in the same year with the same architectural design. Currently, it is the headquarters of the Paro district, housing the head administrator and staff, as well as a monastic body with about 200 monks. From the dzong, hike down to the bridge and then take a short drive for an opportunity to explore the town of Paro. Kychu Lhakhang Temple: This is one of the oldest and most sacred shrines of Bhutan. The inner temple was built by a Buddhist Tibetan King, Srongtsen Goempo in the 7th century. After breakfast, transfer to the Paro airport for departure.